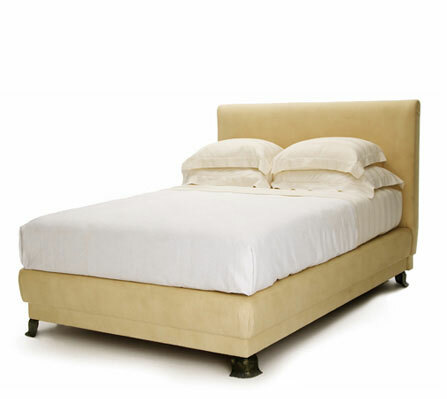 The Etruscan Bed’s curved upholstered box spring is supported by four custom artisan crafted bronze legs. The box-spring and upholstered headboard is shown with cooked brass nail heads on self trim. Legs are available with choice of custom patinas. Nature bed with upholstered box-spring with shirred corners and shirred detail on top of head board and four custom patinated bronze legs. 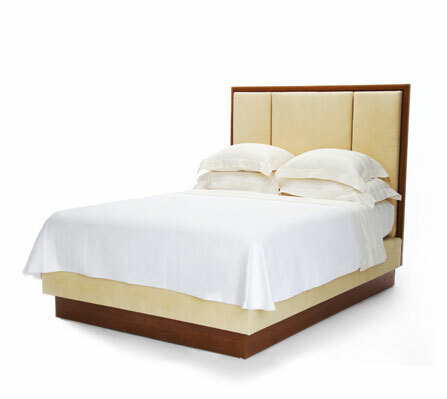 Transition bed with upholstered base, tri-panel headboard and mahogany kick base and trim. Panels are removable for reupholstering.